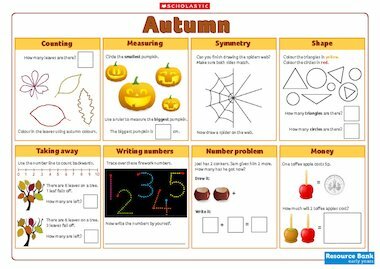 Use this Early Years Autumn Seasonal Maths Activity Mat to practise a variety of maths skills from basic counting, reading numbers, adding, subtracting and doubling numbers, using number lines, and working out number problems, through to comparing sizes and measuring, recognising shapes, creating patterns and symmetry, and handling money. Work on the mat together with a small group of children and assess which mathematical ideas they have understood. They can be introduced at the beginning of a term to evaluate children’s mathematical skills.